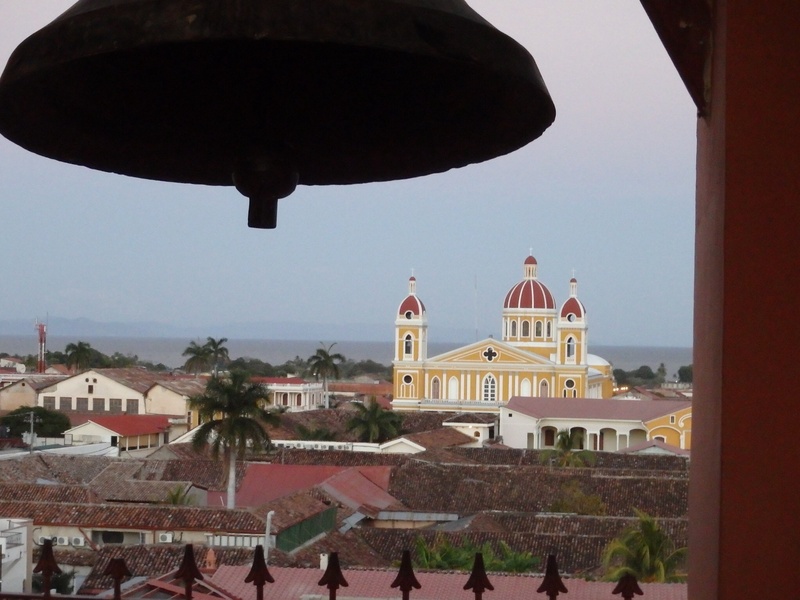 The Merced church here, with its Baroque facade and three naves, was built in 1534 and is one of the oldest churches in all of Central America. While the exterior is unpainted an dull in color compared to the main cathedral a few blocks away, the soft blue interior is bright and cheery. The vaulted ceilings feel open to Heaven. In the mid 19th century an earthquake destroyed the bell tower and it was rebuilt in 1862. For $1 you are given access to the tall, dimly lit, narrow spiral stair case that leads to a most spectacular view. At any time of the day, the views north, east, south and west are amazing, but at sunset, what you see will take your breath away. The blue sky begins to glow around the peaks of the extinct Mombacho volcano to the west. Orange tinges the clouds that hover around the peaks. The sun, which just a few minutes ago was blazing brightly, dims…darkens as it races to hide behind Mombacho. The sky is at once blue and orange and purple and black. Then, the sun is behind the peaks and it’s no longer day, though not quite night. The city around you changes quickly too from blindingly bright to a dimly lit twinkle. This is not a city prone to over lighting. It’s lit enough, but not garishly. A light by which you can read your menu at a cafe on the square, but only barely. Once the sun is down, you have to leave the bell tower, make your way down the twisting stairs where you spill out onto Merced’s plaza, a block from the Centro mercado. The visual high still fresh, the other senses begin to beckon…shouts from the mercado, pollo a la plancha and platanos fritos in the restaurants and carts, to cool breeze on your face and the appetite you built up navigating the stairs. 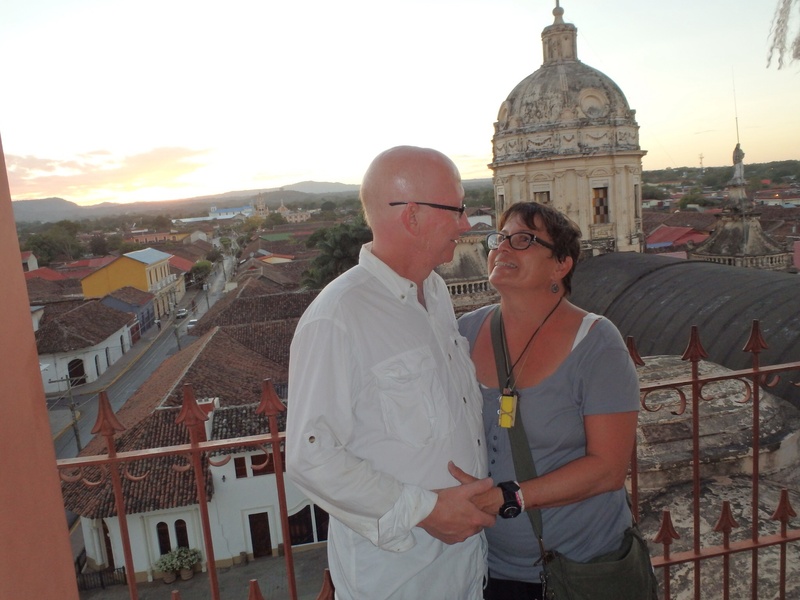 This entry was posted in All posts, Budget, Destinations, Granada, Nicaragua, Photos, Vicki "Mamita" Barnes. Bookmark the permalink.